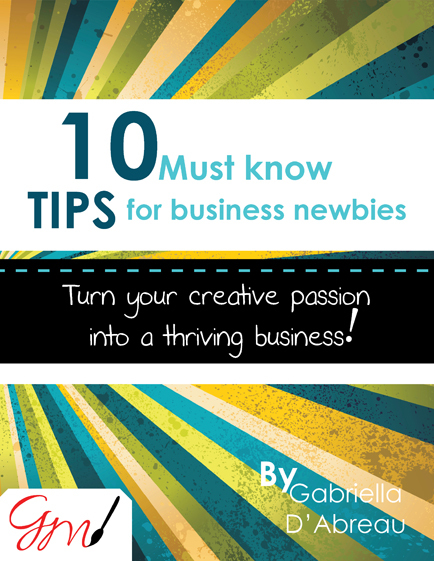 "10 Must Know Tips for Business Newbies"
Happy New Year 2016! I hope 2016 will be both my and your best year yet! Well 3 months have passed since I last updated this latest news section of the page and so much has happened since but I would like to just say there will be a lot more activity on the website this year as I plan to post all my most recent art and design work here as it is completed. Speaking of which I have already begun my first art commission for the year which is super exciting and it is a really fun piece too so I am so excited to get to the painting stage. I will also be doing some wip shots as well as some video of the progress so there will be lots of fun stuff soon both here and on the blog. Speaking of the blog now I have 2 new posts up and will have an additional one out tomorrow so go to the Blog to be in the know! I think you will love these two posts because they are geared towards creative entrepreneurs who have just started or who plan to start their biz. We are happy to share our latest design success! Check out the latest issue of Caribbean Runway published by Mango Publishing available in stores now. Designed by GDVA Design. If you like this check our our new "DESIGN" tab. There you can find a full breakdown of our service listing and a portfolio of our work. Emerge Exhibition was a success! The reception on opening and throughout the event was just fantastic. I still have a few pieces available for sale from the show you can check it out here in the "Emerge" Catalogue. I am pleased to announce my upcoming Exhibition at the ASTT gallery along with 5 other "Emerging" artists hailing from Trinidad. Join the Newsletter Mailing list now. Click here to register.